Effective 1/14/19: Families impacted by the government shutdown can apply for free/reduced meal benefits. Families impacted are encouraged to submit an online application for free or reduced meal benefits during this time frame. Submitting the application online, which is secure and confidential, will help ensure quick processing since applications are sent directly to the School Nutrition Services department. If you have any questions, please contact Mrs. Bonnie Brown in the School Nutrition Services department at 757.547.1470. Households currently receiving free and reduced meal benefits for breakfast and lunch do not need to reapply. Children need healthy meals to learn. Chesapeake Public Schools offers healthy meals every school day. Student breakfast costs $1.35 and lunch costs $2.70. Your children may qualify for free meals or for reduced price meals. Reduced price breakfast costs $ .30 and lunch costs $ .40. All meals served must meet standards established by the U.S. Department of Agriculture. However, if a student has been determined by a doctor to be disabled and the disability prevents the student from eating the regular school meal, the school will make substitutions prescribed by the doctor. If a substitution is prescribed, there will be no extra charge for the meal. If your student needs substitutions because of a disability, please contact Mrs. Jennifer McDermott at (757) 547-1470 for further information. All children in households receiving Supplemental Nutrition Assistance Program (SNAP) benefits or Temporary Assistance for Needy Families (TANF) are eligible for free meals. Foster children who are the legal responsibility of a foster care agency or court are eligible for free meals. Students who are eligible for Medicaid may also be eligible for free or reduced-price meals based on the household’s income. Children who are members of households participating in WIC may also be eligible for free or reduced-price meals based on the household’s income. If your total household income is at or below the Federal Income Eligibility Guidelines, shown on the chart below, your child(ren) may get free meals or reduced price meals. Your child(ren)’s application from last school year is only good for the first few days of this school year. YOU MUST SEND IN A NEW HOUSEHOLD APPLICATION FOR EACH SCHOOL YEAR. Households that are receiving SNAP or TANF for their children as of July 1 may not have to fill out an application. School officials will notify you in writing of your child(ren)’s eligibility for free meal benefits. Once notified your child(ren) will receive free meals unless you tell the school that you do not want benefits. If you are not notified by September 4, 2018, you must submit an application. The application must contain the names of all students in the household, the SNAP or TANF case number, and the signature of an adult household member. If you do not receive SNAP or TANF benefits for your child(ren) complete the application and return it to the school division. If you do not list a SNAP or TANF case number for the child(ren) you are applying for, then the application must have the names of all students, the names of all other household members, the amount of income each person received last month, and how often the income was received. An adult household member must sign the application and include the last four digits of the social security number. If the person does not have a social security number, check the box provided indicating none. You or your child(ren) do not have to be U.S. citizens to qualify for free or reduced-price meals. If you are applying for a foster child, who is the legal responsibility of a welfare agency or court, an application may not be required. Contact Mrs. Bonnie Brown at (757) 547-1470 for more information. If you are applying for a homeless, migrant, or runaway child, an application may not be necessary. Contact Chesapeake Schools Student Enrollment at 757-547-0545 for more information. 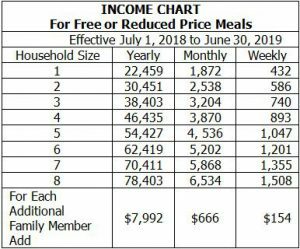 FEDERAL INCOME GUIDELINES: Your child(ren) may be eligible for free meals or reduced price meals if your household income is within the limits on the Federal Income Eligibility Guidelines chart shown above. Access the online Free & Reduced Meal Application here.